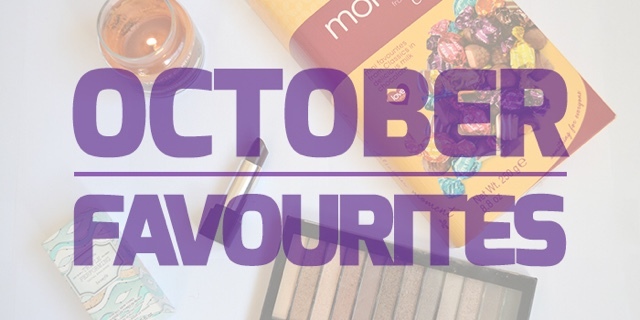 We'll skip over the fact that I missed out a September favourites post, and go straight to what I've been loving throughout October. I actually bought this lipstick for Halloween last year. I was after a cheap dark lipstick and came across this one in Boots and for £4.79 I didn't think I could go far wrong. However, the only problem being that it wasn't as pigmented as it looked, so it wasn't as dark on my lips as I had hoped which meant it didn't really work for my Halloween costume. I wore it a few times and then it went to the back of my draw. However, I rediscovered it this month and I absolutely love it. I love the colour as it's not too dark for an everyday look for work, but you can build it a little if you want it darker for the evening. I love the cute little mirror that pops out of the lid too, though I rarely use it, you never know when it may come in handy! I love this palette (see my full review here) and use it everyday for a simple look for work. Whilst I have 2 of the naked palettes from Urban Decay, I prefer to save them for the evenings and weekends, so this palette from Revolution is a perfect dupe to wear for work. I love salted caramel and I love Yankee candles so when Émil gave this to me for Christmas last year, you can imagine my excitement. However, I didn't get round to burning it much, but I've definitely made up for that this year. 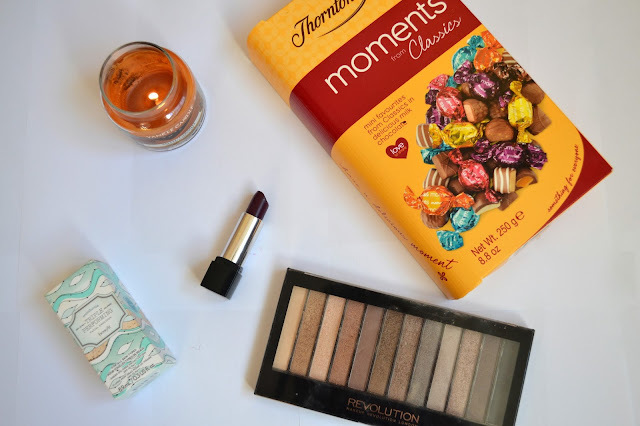 I love Autumn nights, tucked up in bed, fairy lights on, green tea in hand, watching TV with candles burning and this month, salted caramel has definitely been my favourite scent. It does smell more like burnt toffee than salted caramel, but I love it, it's prefect for the Autumn/Winter nights! This is a bit more of a random favourite, but Émil's mum, Rosalie, very kindly bought me a box of Thorntons moments as a well done present for my masters result. I'd never tried them before, but they are amazing! I opened the box one evening and I'm not even ashamed to say I worked my way through quite a lot of them! Thank you Rosalie - they are delicious! Let me know what you've been loving this October in the comments below.